If you’re new to the essential oil’s scene, you may never have heard of Jamaican black castor oil. Even if you do consider yourself part of the essential oils crowd, this may not be one that’s come up on any of your lists. Today, that’s all going to change. This versatile oil has a whole host of applications and plenty of advantages for those who use it. Boasting benefits to your skin, hair and overall well-being, this is one type of essential oil you won’t want to overlook. That’s why we would like to inform you about all the Jamaican black castor oil benefits available to you. Jamaican black castor oil may be the subject of the hour. However, if we want to get a full picture of what this fascinating oil is, then we first need to back up and take a look at regular castor oil. While Jamaican black castor oil may not be something you’re familiar with, the term castor oil may ring a distant bell in your head. Your parents or grandparents may have told stories about being punished by having to take a dose of castor oil if they said or did something inappropriate. And while it’s true that this oil was frequently used as a form of punishment, it has plenty of other uses. Doctors used castor oil as medication for a variety of ailments. It’s also used to make a wide range of products from soaps, perfumes and dyes to brake fluids, waxes and paints. Castor oil is created by extracting the oil from the seeds — also known as beans — of the castor oil plant. Once cold-pressed, this oil looks transparent and pale yellow, like a lighter-colored version of the vegetable oil we use for baking. Jamaican black castor oil also comes from castor beans, which is why it shares a similar name to traditional castor oil. However, the method of extraction is different, resulting in an entirely different substance with different uses. The traditional Jamaican black castor oil process involves the following steps. First, the seeds are roasted before being crushed in a mortar. Water is then added to the mashed beans, and the entire mixture is slow-boiled over a fire. The result of this preparation is a pungent, thick and dark brown oil that we call Jamaican black castor oil. What Is Jamaican Black Castor Oil Used For? Jamaican black castor oil is used to create a wide variety of natural remedies for general health and well-being. 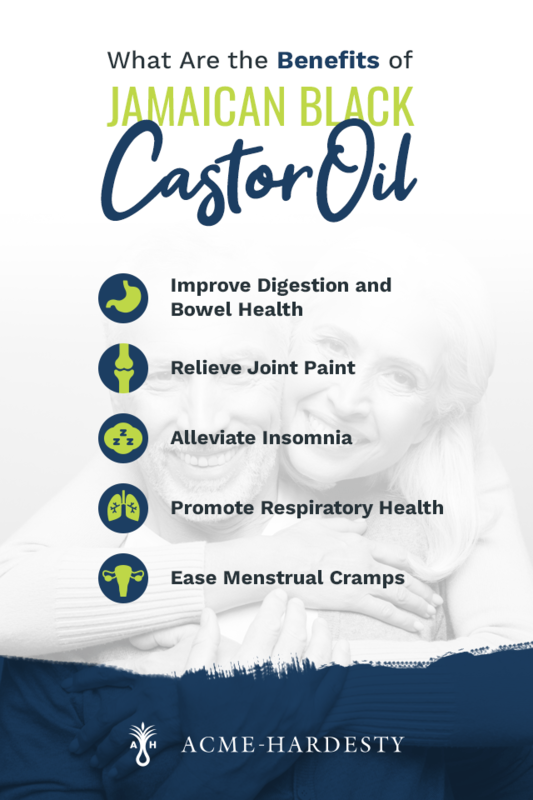 While this castor oil can be ingested for gut health and digestive remedies, it’s also a frequent ingredient in topical solutions that can do everything from promoting healthy hair growth to healing chapped lips. For someone who is curious and looking to dip their toe into the world of essential oils, the biggest question is how to know you are choosing the correct oil for your intended results. When working with Jamaican black castor oil, the sky is the limit. This oil is packed full of so many nutrients and vitamins that it can be used in many different healing and topical ways. Specifically, however, this oil has been shown to be especially effective when used on the hair and the skin. If you have dry, split ends and thinning hair, black castor oil can help with that. And if you’re acne prone and worried about skin infections, this oil can help these areas as well. In addition to these uses, Jamaican black castor oil has several general health benefits, such as relieving joint pain and menstrual cramps. What Are the Benefits of Jamaican Black Castor Oil? Hair and skin are the two areas where Jamaican black castor oil is often highlighted the most. But while these two areas often receive the most attention, they’re far from the only parts of the body that benefit from this oil. Here are just a few of the many other ways Jamaican black castor oil can benefit your overall health and wellness. This pungent oil can do wonders for sore joints or aching muscles. Whether it’s your neck, back or shoulders, you’ll want to apply what’s known as a castor oil pack to relieve the pain and tension. This pack is made by taking a piece of wool flannel cloth and saturating it in castor oil. You may also want to cover this fabric with plastic wrap to avoid staining clothing or furniture, although it adds nothing to the healing process. Add a towel over the plastic wrap, then a heating pad. Apply this pack over the area that’s giving you trouble, then sit back and relax for an hour or so while the oil helps ease the tension in your knotted muscles. If you struggle with falling asleep or remaining asleep through the whole night, try rubbing just one or two drops of this oil onto your eyelids and gently massaging it into the skin. While everyone’s experience will be different, many people have reported that this practice leads to long hours of restful sleep. Take special care to avoid getting the oil in your eyes, however. To use Jamaican black castor oil to relieve menstrual cramps, begin this process several days before your period starts, to give the remedy time to take effect and address the cramps before they even arrive. Take a flannel cloth large enough to cover your abdomen or other area you’re interested in treating. Soak this in enough castor oil to saturate it but not so much that it drips and makes a mess. Place this cloth over your abdomen and cover this with plastic wrap to help keep the heat from escaping. Then, place a heating pad on top of this. Then, all you need to do is sit down and relax with a book or some TV for 30 to 60 minutes while the oil helps ease the cramping. It is recommended that you use this remedy no more than four consecutive days in a week per month. If you’ve been struggling with constipation, an upset stomach and bowels or other digestive problems, Jamaican black castor oil may do the trick. By ingesting this oil, the ricinoleic acid naturally found inside it is released and binds to the walls of your intestines. This prompts them to contract and helps your digestive system to work more smoothly and naturally. However, this is only meant for minimal and occasional use, not a long-term solution. In small doses, ingesting castor oil is considered safe. Ingesting larger amounts may result in abdominal cramping, nausea, vomiting and diarrhea. It is always advised to consult your physician prior to ingesting. Whether you have chronic lung problems or are merely struggling with an acute bout of bronchitis, try a Jamaican black castor oil treatment to help cleanse your lungs. Measure out roughly eight ounces of this castor oil and warm it on your stove before using this oil to soak strips of flannel fabric. Lay a plastic sheet out on the ground or couch, or choose a surface that you don’t mind potentially getting castor oil on it. Lie down on the plastic on your back and place the oil-soaked flannel over your chest and sides, over your ribcage and lungs. Cover this with another sheet of plastic and then lay a heating pad on top of this. By reclining like this and letting the oil draw out toxins from your lungs, you should feel much less congested. Jamaican black castor oil is good for plenty of general remedies, but one of the areas where its healing and restorative properties particularly shine through is in your hair. Whether you’re looking to maintain generally healthy hair or you have a history of unruly, damaged hair, Jamaican black castor oil can provide the nourishment and healing powers your hair needs. Here are just a few of the particular ways this oil can be used on your hair. Mix up a combination of one teaspoon black castor oil, one tablespoon coconut oil and five drops of an essential oil of your choosing, we prefer peppermint oil. Scoop this mixture into an empty container or jar. To use this mixture, scoop a small amount out with your fingers and work it into your scalp using circular motions. Use your fingers to massage the oil into your roots and your scalp, as this will help stimulate the blood flow in your scalp and lead to faster hair growth. If you’re having trouble reaching, you can also ask a friend to assist you with this massaging part. For those of us with dry hair, every gimmicky shampoo promising to “nourish and moisturize” our hair can be a letdown. Trying to find something that actually helps can be a constant struggle. Don’t despair, however. Try the Jamaican black castor oil solution instead to treat dry hair, as well as problems that often accompany this such as dandruff and an itchy scalp. Thanks to the rich omega-6 and omega-9 fatty acids and vitamin E in this castor oil, your scalp should feel cleaner, and your hair should gain a richer, softer texture. To attempt this hair treatment, combine one tablespoon of the black castor oil, one tablespoon of olive oil and juice from half a lemon in a saucepan and heat over the stove. The key here is to get the ingredients warm but not truly hot, or you’ll risk burning yourself. Once the mixture is warm, remove it from the stove and pour it over your hands. Gently massage this into your scalp for about 10 minutes, taking care to give attention to all parts of your scalp equally. Leave this in place for half an hour, then rinse and wash your hair as you ordinarily would. The omega-6 and omega-9 fatty acids in Jamaican black castor oil can both do wonders for thin and easily-breakable hair. These acids will nourish the scalp and strengthen the hair roots as well as improve blood flow to the scalp, which in turn encourages new hair growth, helping to treat thinning hair. This treatment requires a tablespoon of Jamaican black castor oil, a tablespoon of jojoba oil and a dropper bottle. Start by mixing the two oils together in the dropper bottle and shaking to make sure they’re thoroughly combined. Then you’ll use the dropper to apply the oils to your head. Do this by parting your hair close to one ear and applying the oil to the visible skin at the part. Continue partings your hair in different places and oiling them until you’ve worked your way through the oil. Massage your head with circular motions, working the oil deep into your roots and skin. Then, place a shower cap over your head and sleep with this mixture still in place. In the morning, wash your hair as you normally would, rinsing the oil out in the process. Scientific research on this topic is somewhat limited, but many people swear by its effectiveness. If you struggle with damaged and easily-breakable hair, it’s worth giving it a shot. For this treatment, be sure to wear something you don’t mind potentially getting stained. Then, start by taking a bit of oil in your hands and gently massaging it into your scalp and roots. Make sure to get all areas of your head equally, not forgetting any patches anywhere. Cover your head with plastic wrap to keep the oil in place and leave this for about two hours. After this time, wash your hair as you ordinarily would. If you’re looking for a particularly deep conditioning treatment, try leaving this overnight. Have you been struggling with split ends for years, and are always having to cut your hair to chop off those scraggly ends? This oil treatment is designed specifically to help heal this problem and prevent it in the future, while also detangling your hair for easy combing and styling. For best results, try this process twice a week. Mix equal amounts of Jamaican black castor oil and mustard oil and massage this mixture into your scalp. Be sure to rub the mixture down your hair as well, paying particular attention to the ends and making sure to coat them with the oil. Once you’re finished, rinse out the oil and wash your hair as you usually would. Your hair isn’t the only part of your body that benefits from Jamaican black castor oil. This oil can also do wonders for your skin, clearing up acne and healing scars are just some of the many benefits. If you struggle to achieve clear, healthy skin, try a few of these natural remedies and experience the difference. Jamaican black castor oil is well known for its antibacterial and antifungal properties that help slow or even stop the spread of germs. Because this oil is synthetic-free and all-natural, it’s safe to apply directly to the skin without any risk of infection or side-effects. By using this topical treatment, you help increase circulation and blood flow, both of which greatly lend themselves to overall health. If there is a particular location on your skin that’s become infected, such as a mole or an ingrown toenail, try mixing Jamaican black castor oil with a small amount of baking soda and rubbing it into the skin. This thick type of castor oil has been shown to be remarkably effective when it comes to lessening or entirely removing scars on the body. It won't work on every scar, as some are simply too old and too deep to be affected by the castor oil’s healing powers. But for many scars, Jamaican black castor oil may just be the trick to making them a little more invisible. This is because the castor oil actively discourages the growth of new scar tissue. As no new tissue forms around the scar, the oil can then penetrate deeper and aid in the removal of old scar tissue. Start by cleaning the scar area with soap and water to remove any natural oils from the skin. Then, gently massage a small amount of the castor oil over the scar with your fingertips. Be sure to avoid doing this to any open wounds, and only attempt with old, healed scars. Once you’re finished, blot away any excess oil with a cotton ball and wash your hands. Repeat this process twice daily. After several weeks, you should begin to notice results. Whether you can't seem to get rid of your acne no matter what you do, want to prevent the next big breakout or are working to heal the aftermath of the last one, try a little castor oil remedy for clearer, brighter skin. The omega-9 fatty acids found in this oil should help fade your breakouts faster. Pour a liberal amount of Jamaican black castor oil onto your palm and warm it by rubbing it between your hands before gently massaging it into your face. Pay particular attention to any problem areas you may have, or simply give your face a thorough cleanse if there are no current breakouts. With the oil still on your face, soak a washcloth in steaming hot water. Use this wet cloth to wash away the oil, as well as any additional dirt, grime or makeup. Repeat this treatment twice a week. Many of us only struggle with chapped lips on dry, windy and chilly days. But for those of us with chronic dry skin, chapped lips are a curse that seems to follow us all year no matter what the weather. To help moisturize chapped and cracked lips, try this procedure. Mix three tablespoons of Jamaican black castor oil, one tablespoon of butter and one tablespoon of beeswax and melt them together in a bain-marie. Once they begin to heat and mix together, add five drops of your favorite essential oil. Once everything is thoroughly combined, pour the mixture into an empty lip balm container. You can then use this as a lip balm for regular treatment to heal and prevent chapped lips. With a black castor oil treatment, you can reduce signs of aging and help restore a natural youthful glow to your skin. Begin by cleaning your face with a gentle cleanser and patting it dry with a towel, making sure to remove all traces of the cleanser. Pour a small amount of Jamaican black castor oil into your hands and apply it to your face, taking extra care to massage it into any lines or areas you’re concerned with. Repeat twice a day for best results. Looking to buy Jamaican black castor oil and try a few of these home remedies for yourself? Interested in using this as an ingredient in something much larger? Either way, start by heading to our product page and shopping our selection of Jamaican black castor oil here at 18c by Acme-Hardesty. For any additional questions, concerns or inquiries, please don’t hesitate to contact us.